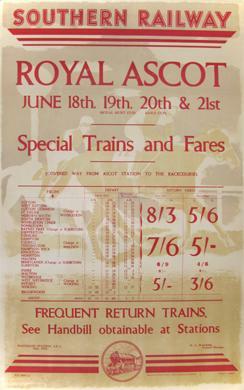 Poster advertising Southern Railway special services to the 1935 Royal Ascot race meeting. I have confirmed the dates of the named races (the Royal Hunt Cup on 19th June and the Gold Cup on the following day). Poster I believe by Graham Sutherland, who earned 20 guineas (£21) for it. It's interesting to see an artist of Sutherland's reputation turning his hand to work like this, but in 1935 he was 32 and had just started painting in earnest, so a few quid probably came in useful. A first class fare from Sutton, for example, cost eight shillings and threepence (41p) while a third class seat cost five shillings and sixpence (27.5p).